This evening I finally cracked a charming little prank that has been played out, targeting me, for the best part of this year. You see, every month or so, I've discovered a sticker on the back of my car. But not just any sticker. Oh no. Every three to four weeks, I would notice my car bedecked with this foul Apple adornment, seared onto the hatch window of my poor little Yaris like a brand on a bull. Every time I spotted it, I would curse the joker who'd decided to "delight" me, and tear it off. And then, a few weeks later, it would be back. Things got very interesting when it turned up on the back of my parents' car when I was driving that for a few weeks while they were overseas. Now let me clarify. After years of derision, I now use some Apple products. However, I do not subscribe to the cult - certainly not enough to want to help Steve Jobs out with free advertising on the back of my vehicle. Obviously it was someone who knew me, knew when I was driving a different car, and attended the same events as me often enough to slip out to the carpark and slap on the sticker. Most of all, it had to be somebody who knew my dislike for Apple fanatics. One person immediately stood out as the likely suspect. Fellow improviser and co-host of the Smart Enough to Know Better podcast, Dan Beeston. 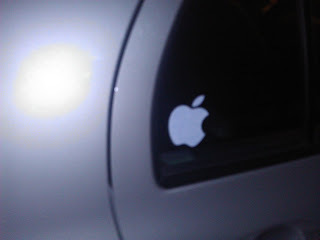 Hell, I've even mocked Dan for having an Apple sticker on the back of his car. It was a fait accompli. Dan denied it, of course. He put on his best dumb face every time I found another sticker and said "I can see why you think it's me, but it's not." It was some impressive acting, I'll admit. But I knew it was him. And I knew it was only a matter of time until I could prove it. Now Dan is currently overseas on holiday. I knew this would be a critical time. If I didn't find a sticker during the month Dan was away, it would be obvious it was him. So I knew he'd have to make a different arrangement. He'd have to bring in a third player. A LACKEY. I even had an idea who that lackey would be. I turned out to be RIGHT. This evening, that LACKEY was sighted mid-Apple-sticking operation. I will not name the lackey, as they were acting (albeit enthusiastically) on Dan's orders. Finally, proof! Proof that Dan was trying to set up a stickering, so I couldn't possibly blame him, because he is out of the country. Now knowing Dan as well as I do, I know that he will be reading this, on his fancy little notebook computer while on his fancy little holiday in France. I know at this stage of the narrative he will be sporting a large goofy grin, while giving himself a hearty pat on the back for being SO GOSH DARN CLEVER. So the only way I can maybe try to sting Dan back is by doing my impression of him, in a state of giddy pleasure at his own genius. I should add that now that I have revealed this long-term prank, that I expect a veritable rush of Apple stickers - and possibly other product placements - to be plastered all over my car. All I will ask is that you keep some of the rear window free, so at least I can see through it while reversing. "It's a stitch up, Guv!! I never did." So let me get this straight Miss Marple? You are positive it must be me because you caught someone else doing it while I'm away? Wouldn't it be more likely that they are the instigator? Do I really sound like that? It's kind of like a cross between a Hollywood reporter and fur seal.